"Friendship After Love" by Ella Wheeler Wilcox is the Songs of Eretz Poem of the Day and the offering from Poets.org's Poem-A-Day for May 4, 2014. The poem was first published in Wilcox's collection, Poems of Passion, in 1883. The poem is in the public domain and legally reprinted here. 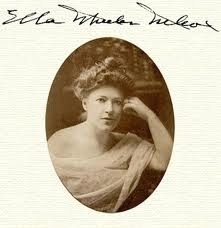 Reference to this and additional biographical information may be found here: http://www.poemhunter.com/ella-wheeler-wilcox/ and here: https://mail.google.com/mail/u/0/#inbox/145c6ccca3d33387. St. Martin's Day, or Martinstag, is celebrated in Germany on November 11. It features celebrations of altruism and modesty, traits associated with Saint Martin of Tours. Food and feasting are also prominently featured, as a fast until Christmas Day follows. Reference to this and additional information about St. Martin's Day may be found here: http://www.timeanddate.com/holidays/germany/st-martin. Ah, the "friend zone," as unpleasant in 1883 as it is over 130 years later. In this traditional Shakespearean sonnet, Wilcox skillfully applies the conceit that love is summer, while the friendship that may follow a failed love affair is St. Martin's Day. The holiday is nice enough, with its celebration of altruism and modesty, but "a touch of frost lies in the air," and the great fast--a passionless, sexless friendship--is soon to follow.